it seems like even though squashes and pumpkins are available year round, i only make them in the autumn and winter. well, except for zucchinis which i only eat in early summer–the “marrows” are light and summery in my mind. the heavier orangey-yellow-flesh guys i reserve for this season, which kicks off when i stick my hands deep into a soon-to-be jac-o-lantern and and scoop out its insides. 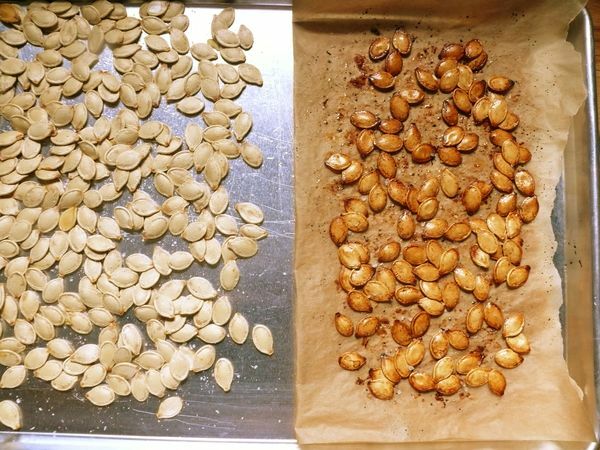 i roasted the seeds above a few days ago. the pale ones have just a sprinkle of oil and salt on them, and the darker ones i doused in oil, lime, tamari, and a dash of cayenne pepper and honey. i like experimenting with the seasonings but the plain ol’ seeds are still my favourite. speaking of experimenting, i thought a round up of good gourd recipes might be appropriate right now. you’re probably diving into these sweet pulps soon too, right? my mom’s pumpkin curry tops my list. it’s still my absolute favourite way to eat pumpkin. i heard she and my father debating how to find a good piece of pumpkin only a few hours ago. my mom is convinced that “jamaican pumpkin” makes all the difference in this recipe, for instance. i will probably have to test that theory at some point soon. for now, i rely on them to source out the good stuff when i want to make this–she has me believing her that strongly! steph, my friend who happens to have been born in jamaica, might agree with my mom, but she reverts to kabocha squash for her jamaican squash soup in this recipe. flavoured with thyme and a hint of habanero, it’s something i craved often last winter after learning her recipe. a batch makes a ton so i highly recommend making some and inviting friends over, or at least freezing it for later. i just eat the leftovers every day for a week. happily. i’m sticking a sweet potato into the list! sliced, breaded and fried in this sandwich, the texture reminds me more of butternut squash then a starchy tuber. i actually want to try something similar with butternut squash that’s been cooked to al dente. it’s kind of an unexpected and fun way to enjoy this vegetable or to make a meat-less sandwich extremely hardy. lastly, and this is hardly a recipe, scraped spaghetti squash, tossed in pesto and drizzled with chili oil is a must try–the three are perfect together. pesto keeps for quite a while in your freezer, and by the time the squash is roasted, a quarter cup of it would have thawed and you’d have dinner with hardly raising a finger. except to lick the pesto container. i always lift that finger. for tonight, enjoy your hollowed out, very scary pumpkins, everyone! happy halloween!